Tami Electronic Robot kit enables students to build robots with electronic circuits and develop control programs with sensory robots too. The resources pack contains step-by-step instructions to build eight robots with electronic circuits and introduces sensors to robots, along with how to program the movement and actions of the model too. 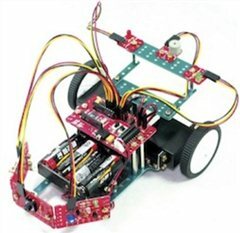 All items you need are included in the Tami Electronic Robot kit including a comprehensive set of construction parts, motors, gears, wheels and battery pack, along with "snap together" electronic components too; Controller (CPU and motor drive board), LED€s, touch sensor, light sensor, contact sensor, infrared sensor and buzzer). engineering challenges and much more.